Stunning 3 bedroom duplex sleeps 6 people with breathtaking views. The Living room ideal for relaxing. The Dining room seats up to six people. Cumbre Del Sol (The translation: Hilltop of Sun) is an apt name for this beautiful costal location situated on the most eastern point of the Iberian Peninsular in the Valencia province, Spain. The duplex is located at the highest point of Cumbre Del Sol in Pueblo Panorama. 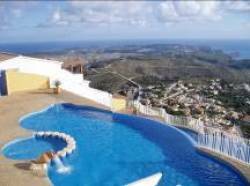 It gives stunning views of the Medterranean Sea and the coastline from Javea to Calpe. Even Ibiza can be seen on clear days. Only 10 minutes drive from the blue flag beaches of Javea and 20 minutes drive from the historical port of Denia this is an ideal getaway. Local restaurants, shops, golf courses, horse riding, cycling, scuba diving, water skiing, wind surfing, tennis, jet-ski, go-karting, fishing, snorkeling, sailing and walking facilities are all available in the surrounding area. The duplex is set on two floors. The living/Dining Room - Furnished to a high standard with two sofas coffee table and large TV unit. The living room leads into the dining room through an arch and consists of a table and six chairs. Both rooms have large patio doors which lead onto the large terrace with amazing views to die for, furnished with a wooden patio set and two sun lounges. Upstairs Bedroom- Fitted wardrobes, two single beds and a bedside cabinet. Kitchen - American style fitted kitchen with electric fan oven and hob, fridge freezer, microwave, kettle and toaster. Utility cupboard: washing machine, iron/ board. Upstairs Bathroom - Tiled bathroom with WC, basin, bidet and shower/bath. Twin Bedroom - Two single beds with small fitted wardrobe, bedside cabinet . Master Bedroom � King Size bed, Two bedside tables, Drawers and TV with SAT tv. Bathroom - Tiled bathroom with WC, basin, Bidet and bath/shower. The award winning �Infinity� swimming Pool - Located only a 3 minute walk away. The pool is on two levels overlooking the sea (no inflatable�s are allowed) you will be given your own private key to access the pools. Parking - Located at the top pf the apartments. Welcome packs can be arranged for an extra charge please let us know what you need when booking. Long Lets are also available please contact us for prices. Pushchairs, Travel cots and a lot more can be hired at the hire shop located at the bottom of Cumbre. NEAREST AIRPORTS: 1 hour's drive from Alicante or Valencia airports. Cumbre del Sol Facilities: There is two shopping centres located at each side of the hill. The main shopping area has Pepe La Sal supermarket, Bank, Chemist/Medical Centre, Bar and La Cumbre Restaurant which has a communal pool for during the day sunbathing and small outside bar for tapas and drinks. The restaurant has a full A la carte menu for the evening. The Lirios Shopping Centre: This centre has Spanish bar, Irish Pub, Bar Lounge, DIY store, Chinese restaurant and hairdressers with more shops opening soon. jo had a fantistic time and will def return i trust eveything was in order .. we are looking to purchase property muro de acloy direction this year so keep your ears open for us .seeking something big that needs money spent on it . just a quick email to say what a wonderful holiday we had. The apartment was fantastic, a home from home, and very clean and tidy. Hopefully we will return soon and I will be sure to recommend the apartment to friends and family, thanks for all your help prior to the holiday. Long term lets are available please contact us for prices and availabilty. Welcome packages can also be arranged.